As we approach Father's Day, it's time to honor the single dads who have returned to dating and are looking for another chance at love. For the divorced woman or single mom who's looking for love online, blending families with a single father is something to consider for the next chapter in your life. According to Match.com, single dads are now 46% more likely to meet someone on their site as compared to men who are childless. Add in the fact that over 50% of single men will contact women with children than those without, the forecast for starting over post-divorce is far from bleak. In a recent Match survey, the online dating site recently looked at their membership base and searched for keywords for single fathers aged 30-50 in 3 popular niche categories. The results appear below in the 10 top most popular cities in each category to find a date from your computer screen. Arizona leads the list with two cities, Chandler and Scottsdale, in the top 10 to meet sports-crazed dads. Runners up in this category include Milwaukee - WI, Henderson - NV, and Charlotte - NC. 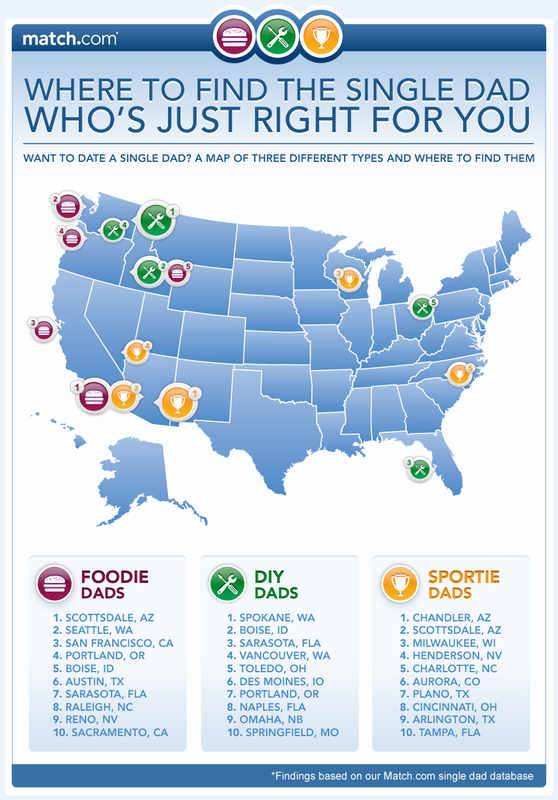 If you're looking for love in the kitchen, Scottsdale leads the list of foodie-dads, followed by Seattle -WA, San Francisco - CA, Portland - OR, and Boise - ID. Not interested in hiring out? Head back to Scottsdale, as it's the number one locale for do-it-yourself dads as well. Other cities with love-oriented handymen include Boise - ID, Sarasota - FL, Vancouver - WA, and Toledo - OH. Whitney Casey, Match.com's Relationship Insider and author of The Man Plan took time from her busy schedule for a Q and A on the subject, where we discussed their findings along with trends of single parents dating online. Julie Spira: 30% of your male subscribers are single dads. Is this number continuing to increase? Whitney Casey: Definitely. With our members 40 and up, often their children are signing them up for Match. Their kids are on Facebook and they encourage mom and dad to go online as well. The kids don't see the stigma with online dating as they grew up with Facebook and Google. Julie Spira: What made you select do-it-yourself, sports-crazed, and foodie-dads? Whitney Casey: At Match we decided to look for keywords that women put in their profiles. Many women wanted a guy who could cook a great meal, be handy around the house, and share similar interests in sports and activities. Julie Spira: Why do you think single dads find logging in from 6-9am such a popular time? Whitney Casey: If you ever want to get a man to do anything, ask him in the morning. When men wake up, their testosterone level is at the highest. They're busy getting their "to do" list done and it's a perfect time to go online and sift through who may be attractive and write to them. They don't have the distractions yet with their children and job in the beginning of the day. Julie Spira: 68% of single dads wait at least 3 months before introducing someone they met on Match.com to their kids When is the right time to introduce your children when you're dating? Whitney Casey: I talk to a lot of men who introduce their kids to everyone who comes over by saying, "This is my friend" or "This is daddy's friend" if they aren't looking for a serious relationship. I don't think there's a right or wrong time as long as they aren't spending the night. Julie Spira: Why do you think over half (56%) of single dads will email single moms than men without children? Whitney Casey: Because they feel a little bit lost. They don't have a lot of direction on how to raise the children. Often they don't want to have more kids, so by dating women who already have children they won't feel pressured into having a second family. Julie Spira: What recommendations to give to single fathers dating on Match? Whitney Casey: Don't talk about your children on your first date. Focus on the woman's profile. It's the best way to her heart. She has given you the keys to her kingdom by filling out her profile, saying where she'd like to go. Men should look at the woman's profile like it's the cliff notes or a cheat sheet for first date conversation. Julie Spira: What do you suggest the woman give as a Father's Day gift to the single dad she's dating? Whitney Casey: If you've only had a few dates, send him a test message saying "Happy Father's Day." You don't need to buy a card or a gift. It's overkill. After three months, give him a golf lesson, tickets to a sports game or two tickets to an event where he can take a friend or his son or daughter. For the music lover, get him an iTunes gift card. It's the equivalent of a man sending a woman flowers. If your city isn't on this list, there's no need to fret. Log on to an online dating site and expand your search to other zip codes. With over 116 million people worldwide visiting Internet dating sites every month, it's easier now than ever to get lucky-in-love. For more dating and relationship advice, visit Julie at CyberDatingExpert.com and like her at Facebook.com/CyberDatingExpert.